Latest ECMWF has H85 temps at about 22 C. GFSTrend is at nearly 24 C, but H5 heights are trending down across Manitoba/North Dakota (meaning the incoming short wave is speeding up). So the question becomes, how fast will the short wave ridge axis move across Minnesota? 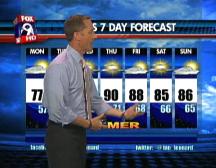 If it is slow enough, that warming could be realized Thursday which would easily put a MaxT at MSP in the 94-98 range. I don't think I'd be as ballsy as Dahl to toss 100 out there as I don't think it will be that warm (you'll also have things to contend with like possible remnant mid level clouds from upstream MCS activity, increased boundary layer moisture which will slow warming). Also note that the record high on 1 July for MSP is 100. As of right now, put me down for a solid 95 at MSP on Thursday 1 July 2011. @P Just added the NWS forecast. All outlets, besides Dahl, are simply looking at the GFS MOS forecast and going with it. You gotta give DD credit for going out on a limb. Perhaps a bit too agressive, but I like it that he is going with a gut feeling. It shows that he is doing his homework and taking a risk. I think I might go with Dave Dahl. Even though it seems crazy now, The last heat wave he nailed, while other forecasters posted lower 80's. A recent trend that I have noticed was that the forecasters are typically a few degrees below the mark. Dave Dahl could be below the mark, for all that we know. Kare 11 surged their projected high up to 95 this morning. Looks like DD might be onto something...again. Good stuff, Randy! A temp of 85 with a dew point of 80 sounds crazy to me... then again what do I know. What's LCL mean? having said that...according to the Minnesota Climatology office the highest DP recorded in June in the metro between 1902-2008 was on June 22nd 1983 at 80°....could the GFS be right? LCL = Lifted Condensation Level, or in other words the level where an air parcel becomes saturated. Typically this is the height of the base of the clouds. These are watched a lot during potential severe weather days. If the LCL's are low, it means low cloud bases, and is one of the things needed for tornadic storms. This image kind of explains it. All of the aggressive weather forecasters should be worried about AM storms on Thursday creating havoc with their predictions. I've seen this happen way too many times where the computer models have a tough time picking up on overnight MCS development on the leading edge of a strong CAP. That scenario could easily play out tomorrow AM. If this indeed unfolds, then temps will be held down a bit Thursday PM. However dewpoints will definitely be an issue later in the day. My gut feeling is that Friday will be warmer than tomorrow. 100 may not be in the cards,but it definitely be a hot spell,90's TH/FRI/SAT. is a good bet. Thursday will be highly dependent on cloud cover and how high the dewpoints get. Air with higher moisture content is more difficult to warm and cool. Friday's temps will depend on the cold fronts timing. Temps will probably be in the 80's on Saturday, and Friday's highs might be seen early if the cold front comes through early rather than later. 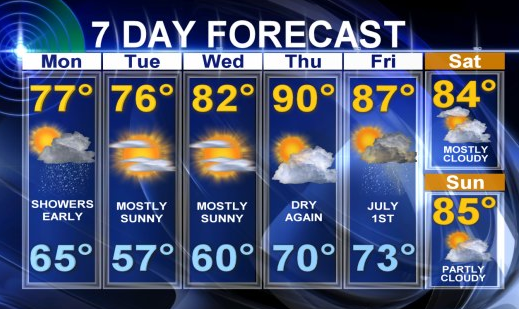 Either way, it's gonna be hot and humid over the next couple days...very typical for the 4th of July time frame. Stay cool all. I think its just going to be too humid to get to 100. Just a quick little side note, and this look really didn't show up until tonight's run, but the SPC has added a slight risk of severe on Friday. While the cold front isn't incredibly strong, there will be a lot of instability available for it when it comes through, and it would seem as though the upper levels will cool enough that the cap will be gone and storms will fire. Capping is still a concern from the SPC at this point, and they mention this in their discussion. I'm curious to hear what Novak and others think about Friday's look. Gonna be way to capped obviously for anything today. There will be some mid/upper level blow-off clouds over MSP today which will maybe take a a degree or two off the warming potential. 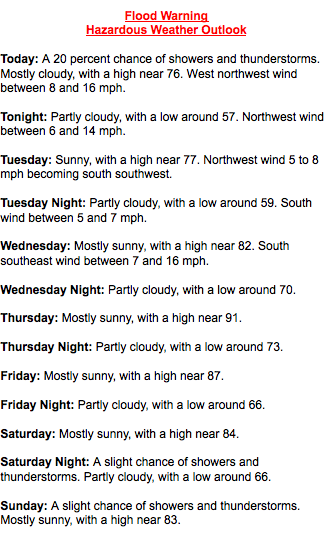 I still feel good about the 95 I forecast several days ago. I think Dahl is gonna stay in left field by himself today. I think severe storms on Friday are a given once the front comes in. Look at those surface dew points in the low 70s all the way up into southern Manitoba! Timing looks really good even for Central and Southeast MN. That short wave will be coming right on in. SREF showing CAPE through the roof given all the heat and moisture in the boundary layer and the rapid cooling above. I'd expect some big hail and bowing line segments. Actually surprised SPC isn't hitting it harder. I'm still worried about storms today esp. this afternoon & evening. Everything is evolving slower than what models were predicting & now the NAM is latching onto a broken CAP environment later today. Combine that with a warm front that is straddling eastern MN and you easily could get severe T'Storms by evening over eastern MN & Wisconsin. We will need to watch this closely. As far as tomorrow is concerned, the whole day will be rather interesting. I don't think there is any doubt that surface temps will be higher Friday than today as winds turn more S/SW rather than S/SE like today. Gut feeling is that central & northern MN along with NW Wisconsin will be the bullseye for severe as Cool front/dry line approaches from western MN. I like the set-up for severe from MSP north. 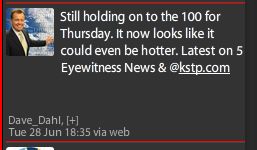 As far as Dahl's & KSTP's prediction is concerned, I believe it is unfair to bash them if we do not get close to 100 today. Fact is, we will likely come close, if not today, then tomorrow. DD was the first media Met to really sound the sirens on this end of the week heat wave & now everyone else, including the NWS, is latching onto the idea of life threatening heat. I will be shocked if we exceed 95 degrees today, but I won't be shocked if we exceed 95 tomorrow, esp. from MSP on south. It will be interesting to see if the SPC reshapes their slight risk area to include eastern MN in their late AM update, esp. after viewing the 12z NAM output. Right now, the SPC totally disregards eastern MN due to the strong CAP overhead. Why would it be warmer tomorrow when the strongest WAA and 850 mb temperatures move off to the east? There will be even more debris clouds too. I think you're off base there. Interesting thoughts on convection today...I don't think it will happen though. 89 degrees with a heat index of 98 and a dew point of 75. There is a narrow cloud band moving in from the west, but give it an hour and today will officially be more oppressive than June 7th. P: Temps over much of central and eastern NE are near or exceeding 100 degrees. Meanwhile, there dewpoints are only in the 50s & 60s. That hotter and DRIER airmass will move into a good chunk of southern MN tomorrow. Granted, the airmass will be modified and Dews will still be high, but they won't be as high as today. NAM has 850mb temps slightly higher tomorrow at noon than today. Our biggest problem today is the moist airmass and high dewpoints. Doesn't heat as well. Do you guys think we're going to see action in the skies later today, or are we just too heat-capped here in the Metro? The CAP is solid. We need a disturbance to break the CAP. Highly questionable that the tiny disturbance moving into the Metro will be suffice. Novak your thoughts please. Looking at vad wind profile off of GR3(winds that the radar see) I'm seeing winds out of the west-northwest between 24k and 27k feet...some cloud tops are are 21k, if the tops get to that level could something develop? There are clouds, mammatas and sprinkles in the west metro. "I hate to toot my own horn.."
Yes, the NAM, once again, performed poorly yesterday. Forecasters need to take the NAM into consideration, but with a grain of salt. For some reason, it was breaking the CAP yesterday, even though the CAP was air tight and solid. I have to give a big thumbs up to the SPC, they nailed it yesterday and never bought into the NAM. Today is a whole different story since we actually have a fairly strong disturbance coming out of the Rockies into the Upper Midwest. There is no doubt in my mind that Severe Storms will develop over a good chunk of MN by evening. I'm still thinking that east central MN & northwest WI will be the bullseye for this severe event between 4pm & 10pm. The only negative factor for a widespread event appears to be the lack of shear/twist in the atmosphere. If this disturbance comes out stronger than expected, then watch out. Meanwhile, if we can get several PM hours of straight sun, I wouldn't be surprised if some locales from MSP on south approach the 100 degree mark. This is where the air will be just a touch drier. Many areas in Iowa will likely touch 100. I don't think MSP will see 100 today, probably 93-96 again. Big storms will fire on the cold front this afternoon/evening. I'd expect to see some large hail (3"+) reports with these storms and wet downbursts. Maybe some bowing line segments due to cold pool actions. Pretty wide swath from Sioux Falls to Duluth should see this Action. For those of you who own GR2analyst, and want to see scans of recent events, they can be found on this site. Keep in mind that it only archives about 4 or 5 days back though. The files are named with a time stamp, so just look for the time you want, click on it and download it, then open the file in GR2analyst. A Case of Dew Point Inflation?